Even though it was their opening game of the season, Boulder City softball coach Angelica Moorhead called it an important test for her Lady Eagles. Playing Division I-A region rival Faith Lutheran is always a tension-filled game, she said. Each batter, each pitch, each inning can lead to a game-breaking rally. The two teams also have met in the playoffs in several seasons. But if this season opener is an indication of the season, Boulder City will again be successful as it looks to return to the state tournament in 2015. Boulder City has played in the state softball tournament in five of the past six years and has made the playoffs in 19 consecutive seasons. They won the state championship in 2010 and were state runner-up in 2009. Lady Eagles junior pitcher Charlie Masterson kept the Crusaders in close and patiently waited for her team to score runs. They did — in their final at bat — scoring three runs in a 5-4 walk-off win Friday. It was a close resemblance of last year’s Southern Region tournament where the Lady Eagles rallied from behind to defeat Faith Lutheran and advance to the state tournament. A year ago Boulder City was 25-5 in the regular season and 12-0 in the Sunrise League to enter the postseason as a No. 1 seed. They placed second in the regional (3-2) and fourth (0-2) at the state tournament. Last Friday, Jessica Embro singled home the tying runs with one out in the bottom of the seventh inning and scored the winning run with two outs in Boulder City’s victory against Faith Lutheran. 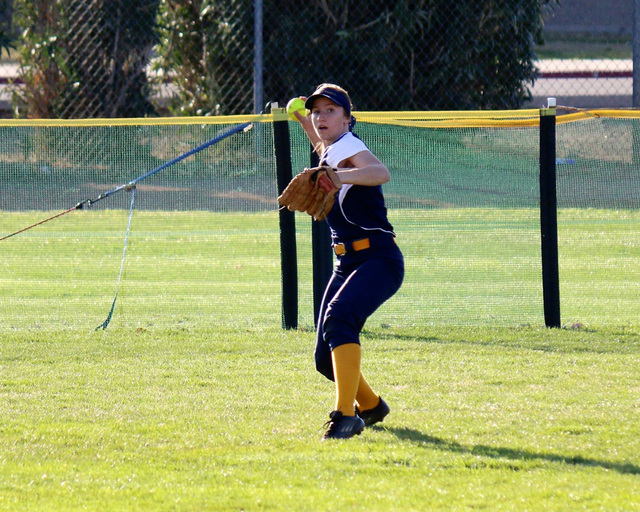 The Lady Eagles trailed 4-2 before Alyssa Ybarra started the seventh-inning rally with a one-out single. Kylee Hamel reached first base on an error, and Embro singled to drive in two runs and tie the game. Embro moved to second on a ground out and to third on Bryanna Lopez’s single before Jordan Moorhead reached first base on an error that allowed Embro to score the winning run. Ybarra was 2-for-4. The Lady Eagles will play today through Saturday in the Colorado River Invitational at Needles, Calif., before beginning Sunrise League play at 3:30 p.m. Monday at Desert Pines. Coach Moorhead said she is planning a lot more success for her 2015 squad. Lopez, a junior, will be the catcher. Last season she had a .394 batting average and had 11 RBIs. Masterson will be the No. 1 pitcher and will play second base. She batted .650 with 47 RBIs and as a right-handed pitcher had a 2.37 earned-run average. The outfield will be led by seniors Ybarra (.412, 12 RBI), Embro (.462, 12 RBI) and Lauren Axelson, with help from junior Jeanne Carmell and freshman Jerra Hinson. The infield this season will be rounded out by junior Hamel at first base, and three freshmen: Moorhead (second base, pitcher), Micayla Gegan (shortstop) and Lily Osman (third base). Senior Arcadia Pacini and junior Kelsey Essex also will be playing in the infield. “We have a very busy schedule this season and hope that a lot of people can come out and enjoy the great game of fast-pitch softball and the great effort given by our players,” Moorhead said.